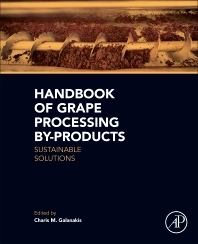 Handbook of Grape Processing By-Products explores the alternatives of upgrading production by-products, also denoting their industrial potential, commercial applications and sustainable solutions in the field of grape valorization and sustainable management in the wine industry. Covering the 12 top trending topics of winery sustainable management, emphasis is given to the current advisable practices in the field, general valorization techniques of grape processing by-products (e.g. vermi-composting, pyrolysis, re-utilization for agricultural purposes etc. ), the newly introduced biorefinery concept, different techniques for the separation, extraction, recovery and formulation of polyphenols, and finally, the healthy components of grape by-products that lead to target applications in the pharmaceutical, enological, food and cosmetic sectors. 1.3. The Grape Processing Solid Residues: Waste or By-Products?